I turned 40 in September. So far, forty is most certainly fabulous. 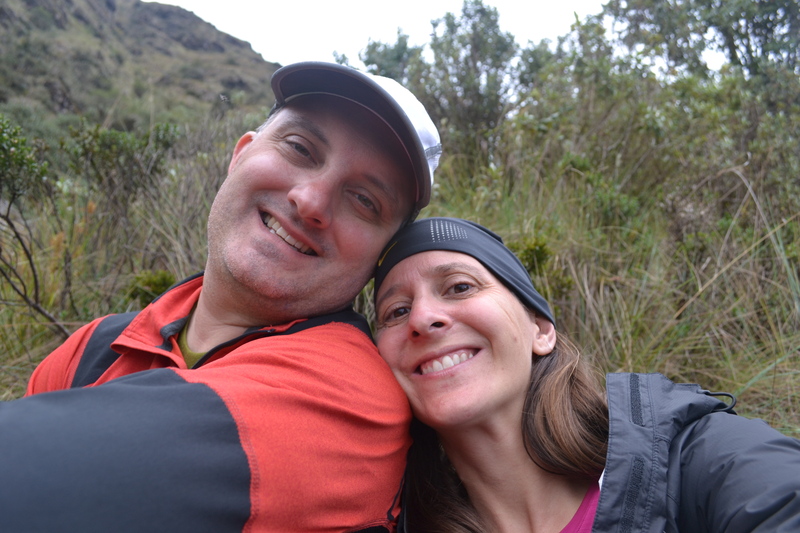 In addition to running the NYC Marathon at the beginning of November, my husband and I celebrated this milestone birthday with a trip to Peru this month. 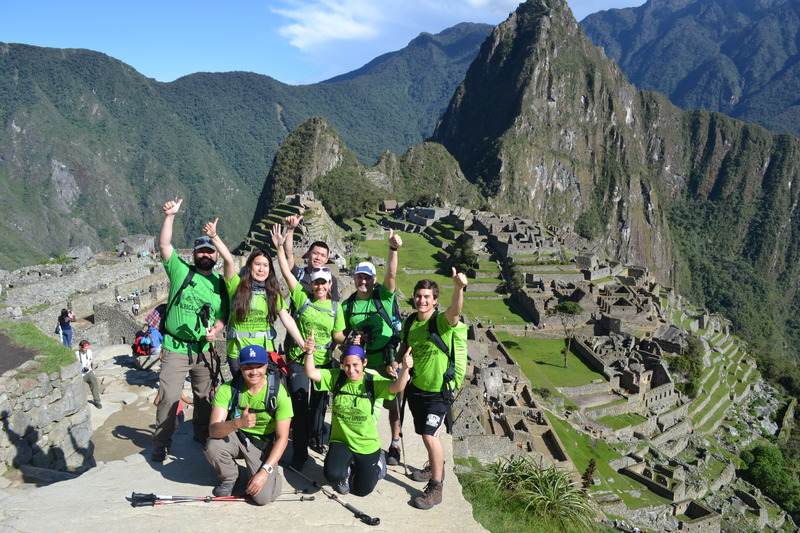 The cornerstone of our trip was a four-day, three-night trek along the 45 kilometer classic Inca Trail, finishing at Machu Picchu. As an architectural historian-turned-fitness trainer, this trip has been on my travel bucket list for a while. I’ve struggled with trying to recap the trip. Every time I sat down to write a review, it was as if my whole being was still on sensory overload. 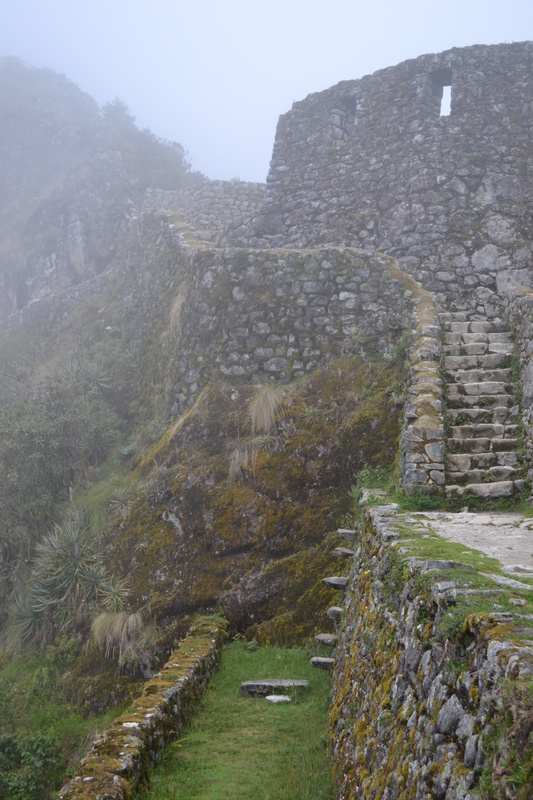 So instead of a typical trip review, I’m going to describe the Inca Trail by the senses. The trekking group of Alpaca Expeditions. Just a few hours into Day 1, our guide Saul asked us to step off the trail. He asked us to link arms and close our eyes. We then walked toward his voice, near the edge of a cliff. It was a real trust test. Just as I was getting really nervous, he asked us to stop, take a deep breath, and open our eyes. In front of us was the great pre-Inca site of Patallacta, first inhabited around 500BC. 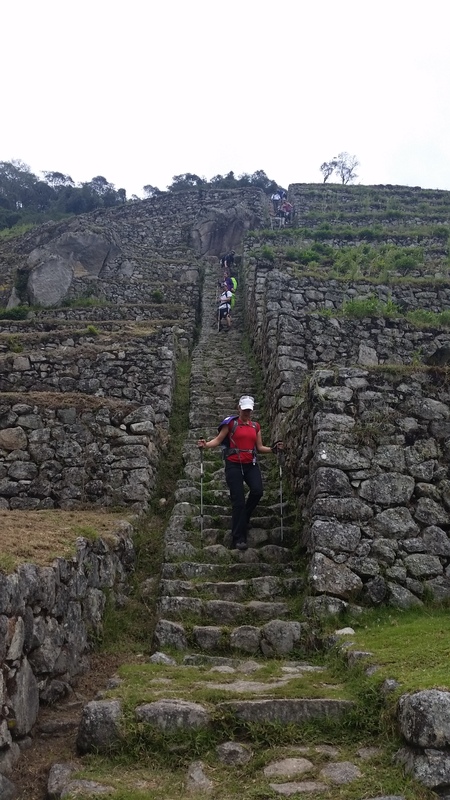 It was a transforming experience, immediately heightening the awesome reality that we were really on the Inca Trail, where people have walked, lived, traded, and built for centuries. 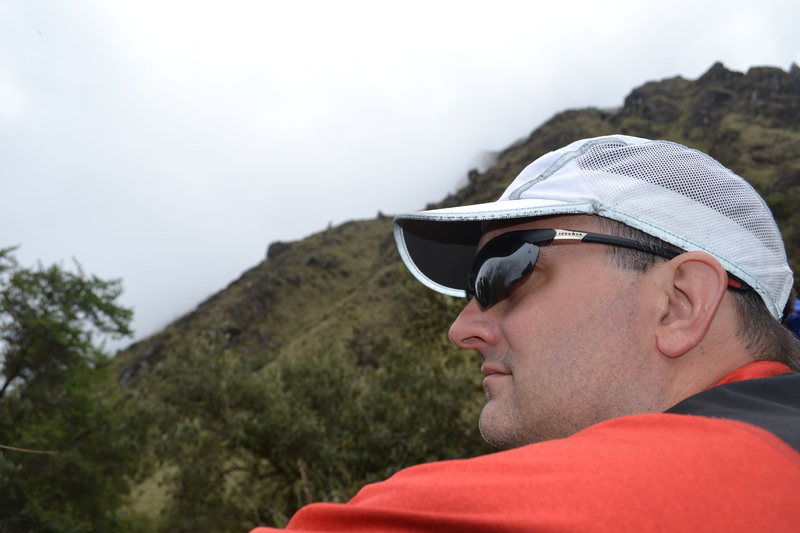 Being high up in the mountains, we were in “the cloud forest” for much of our trek. Watching the clouds roll in, lift up, and blow through a valley was surprisingly captivating. 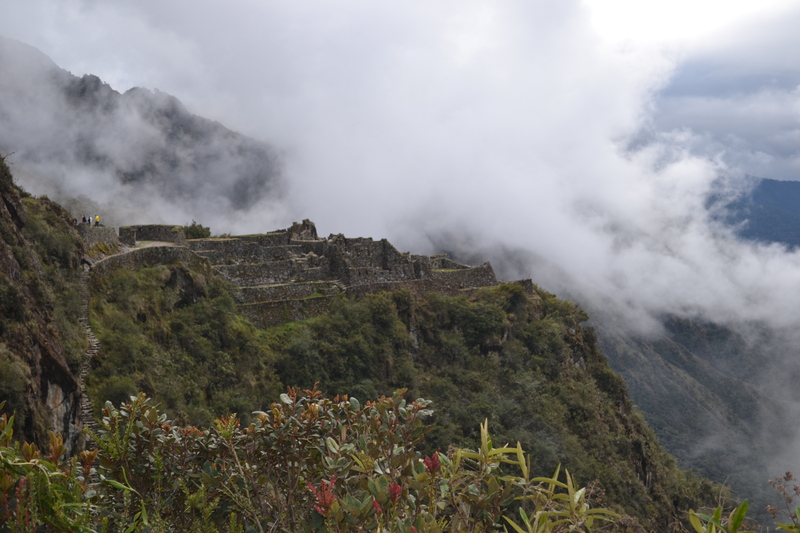 My favorite example of this phenomenon was when we arrived at Phuyupatamarka (“village above the clouds”) in the morning of Day 3, and our guide Saul told us that Machu Picchu mountain was across the cloud-filled valley. 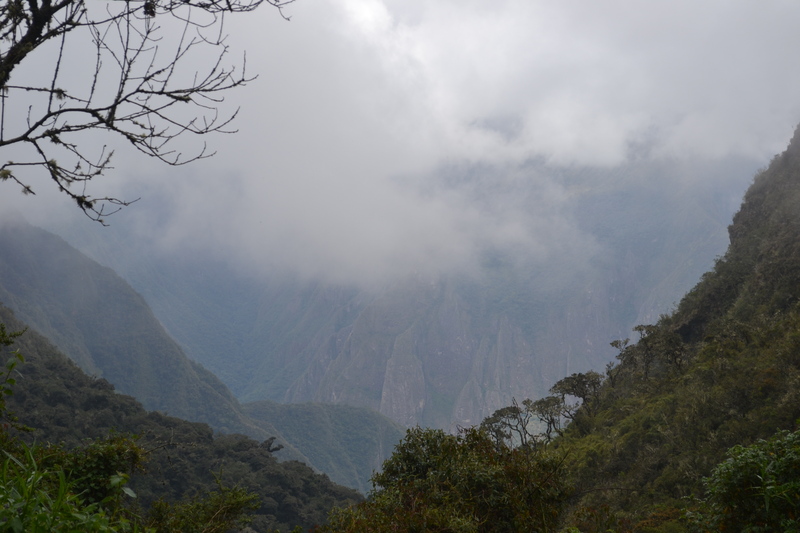 He looked out and across the sky, and he said, “Let’s wait about five minutes; the clouds will lift, and you’ll get your first view of Machu Picchu mountain and Aguas Calientes.” Sure enough, we waited and the clouds evaporated just as he said they would. 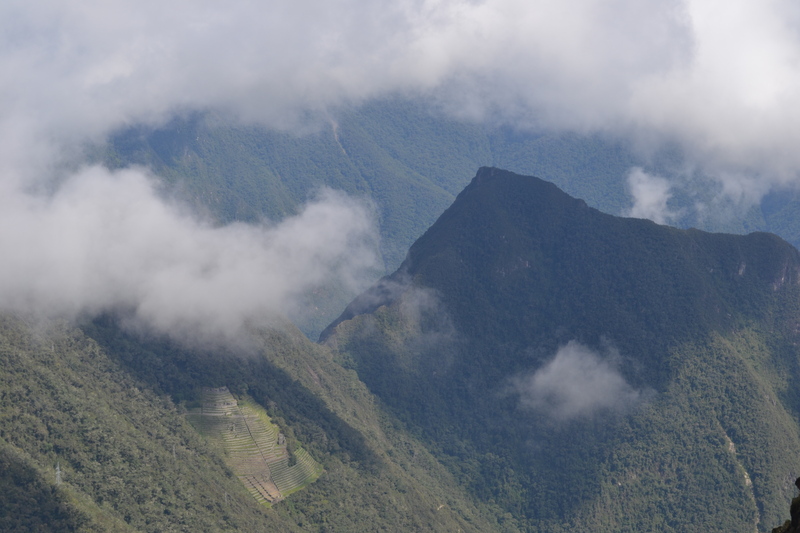 He told us the history of the site—a communication post to call across the valley to the sentries stationed on Machu Picchu mountain–and just as he finished and we set off, the clouds descended on the valley once again obscuring the view. Five minutes later, the clouds lifted just as Saul predicted. 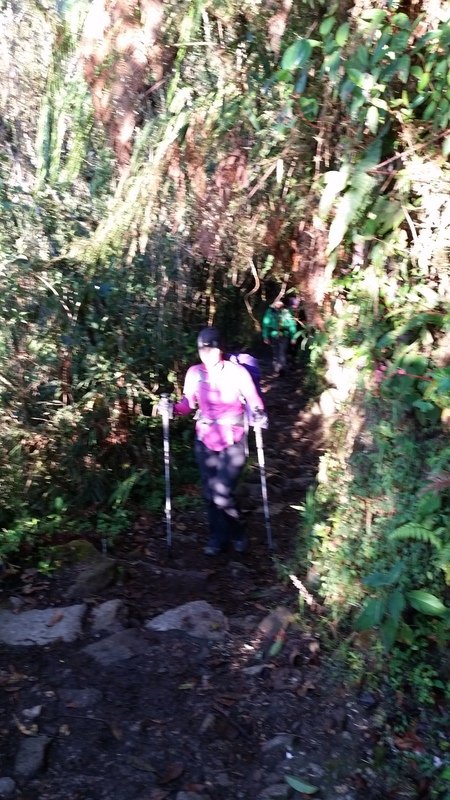 On Day 3, we hiked through the rain forest and jungle. There were a lot of beautiful butterflies, the likes of which I’ve never seen before. But what caught my eye was this shimmery, iridescent white butterfly that had purple and yellow under its wings as it floated across the sky. It was so perfectly magical, it almost seemed fake. 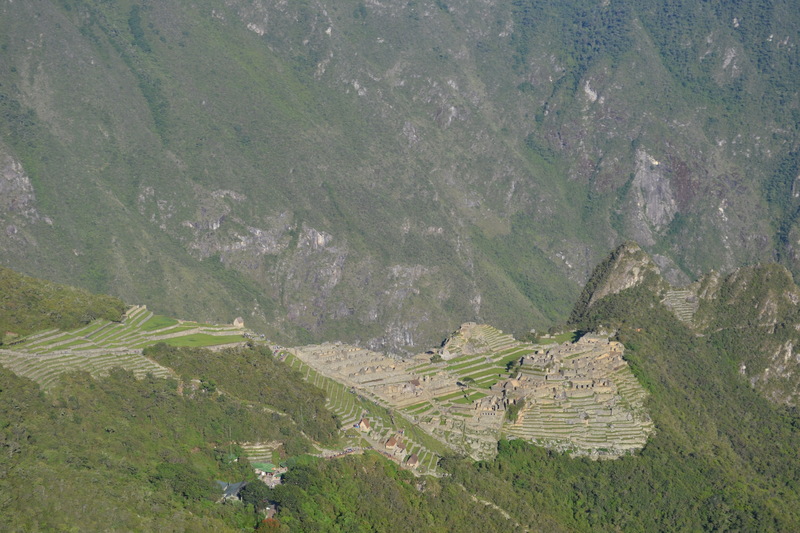 Before the trip, I was a little afraid that seeing Machu Picchu from the Sun Gate wouldn’t live up to the hype in my head. I was wrong. Standing there on a bright, clear morning, looking 1000 feet down at the forgotten city, I got tears in my eyes. It was, quite literally, a breathtaking experience. The stars. 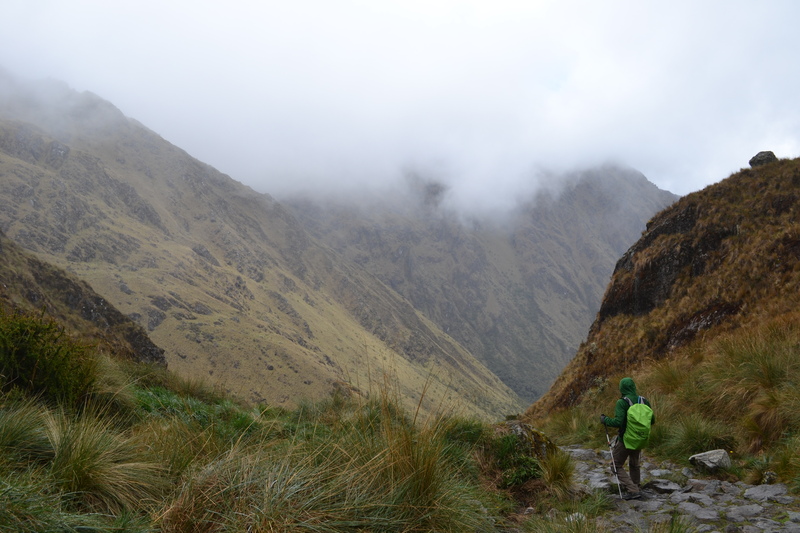 One of the reasons I wanted to hike the Inca Trail was because I wanted to really escape and surround myself in the natural world. I was hoping to catch a glimpse of a wide night sky. We were blessed with clear weather during our trek, and the nights were positively spectacular. Being able to see the night sky in its magnificence was a perk to waking up early (like 3:30am early) while on the trail. The climb up to Dead Woman’s Pass (13,829 feet) on Day 2 had the soundtrack of heavy breathing. We would walk for 5 minutes, rest for a minute, and repeat…for two hours. The trail itself was quite good on the climb—mostly dirt trail as a ramp with a stone step up every 10 steps or so– but the altitude was a challenge. After lunch Day 2, we descended a series of stone steps for about 30 minutes before coming to a clearing. It was so magnificent; we just stood and took it all in. The next thing I knew, Saul had pulled out his pan flutes and was playing “Let It Be.” Rather than being cheesy, it echoed beautifully among the mountains and filled the vastness. 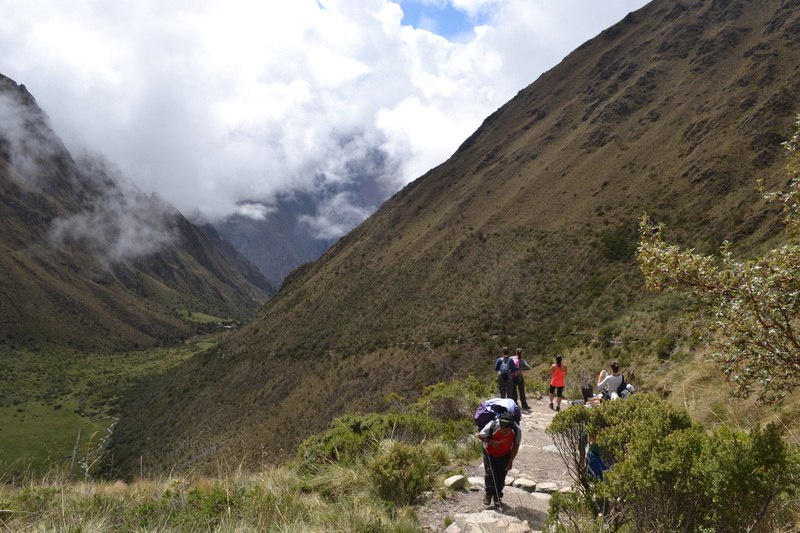 I loved listening to the chaskis (aka “porters” — Chaski is the Quechua word for “Inca runner”). The Quechua language is one-part guttural, one-part clicks, and one-part fluid language. As they passed us, heavily-laden with enormous packs, they’d be chatting. The chaskis also laughed. A lot. 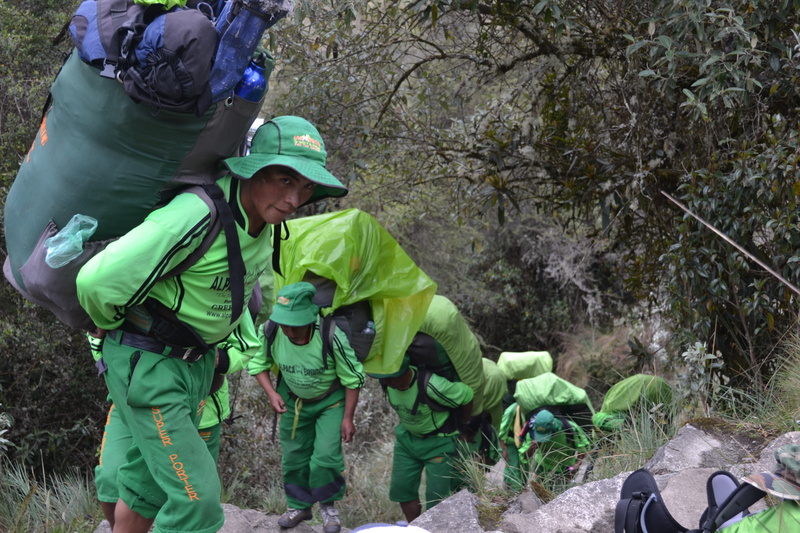 It was clear that each trek brings together a community of men who enjoy each other’s company while working hard. I admire that. There was a thunderstorm during lunch on Day 3. The thunder rumbled so loudly, bouncing around the mountains. One time there was even an extra “POP” after the thunder from atmospheric energy. I’d say it was cool, but I was freaked out of my mind. Having time to talk with—and listen to—John was a real treat. After fifteen years, we had nine straight days of uninterrupted conversation, and I still love hearing his voice. I did tell him to quit singing “I hike the Inca Trail in the morning sun” after the 1,000th time, though. Coca tea—the coca plant grows in the rainforest of the Andes, and its leaves are used to combat everything from nausea to headaches. As such, the leaves are steeped in hot water to be used as a tea to combat (or help prevent) altitude sickness. It tastes fine, but OMG the smell. Nasty. I found that if I exhaled while sipping the tea I could drink it fine. But if I forgot, the smell turned my stomach. Popcorn. You’re smelling it right now, aren’t you? Imagine coming in to camp after 8 hours of hiking and smelling popcorn. Pure awesome. We had a 10 minute rain shower as we sat on the top of Dead Woman’s Pass on Day 2. As we descended the million uneven, slippery stone steps down the backside of the pass, the air had that freshly scrubbed clean smell. Maybe it was just the altitude, but I couldn’t get enough of it. Llamas are endearing to watch. But they stink. A lot. 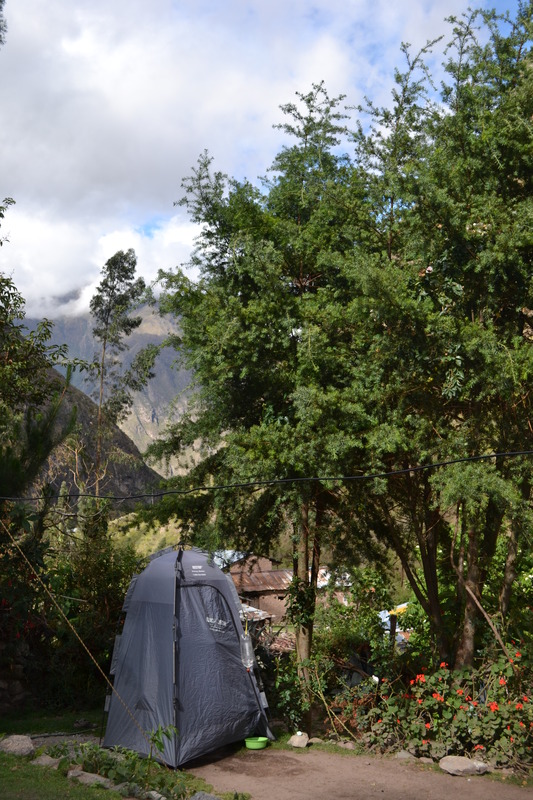 Free advice: If you’re going to trek the Inca Trail, choose a tour company that has its own toilet. Just trust me on this one. 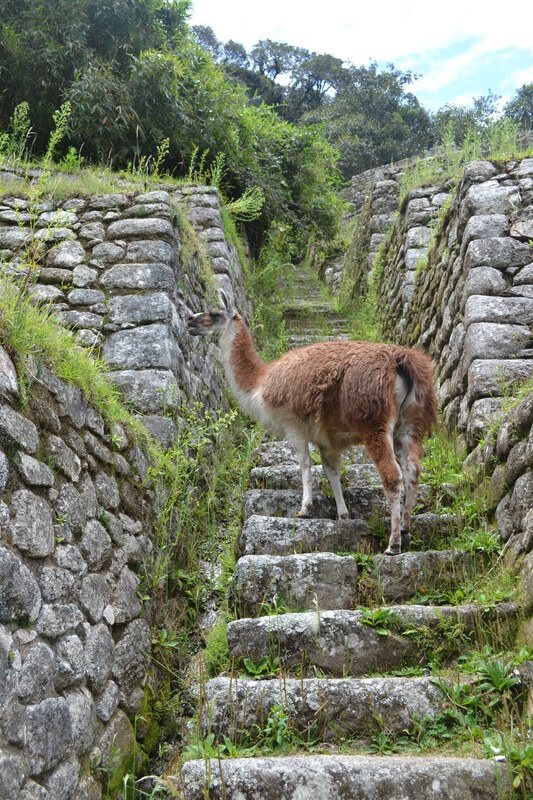 The best part of hiking the Inca Trail is getting to explore the many Inca archaeological sites along the way to Machu Picchu. 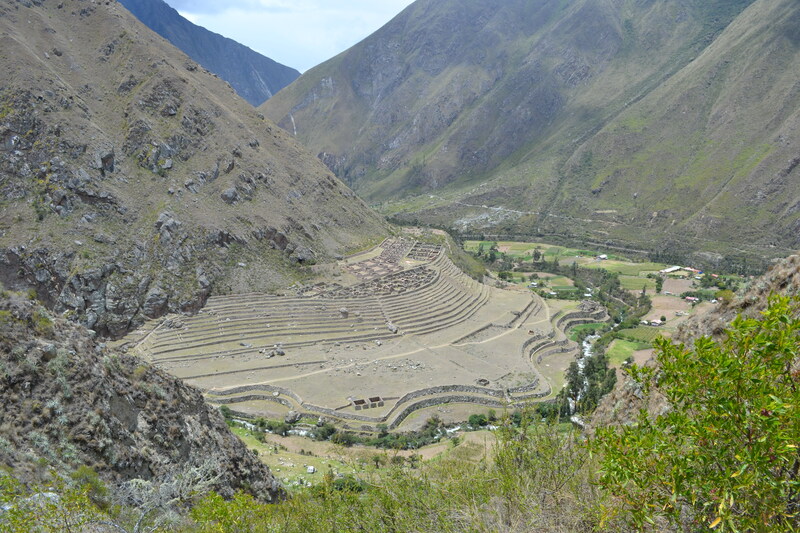 At these sites, we were given a history by Saul, then we were free to wander around, see the Inca’s handiwork up close, and examine the constructions. 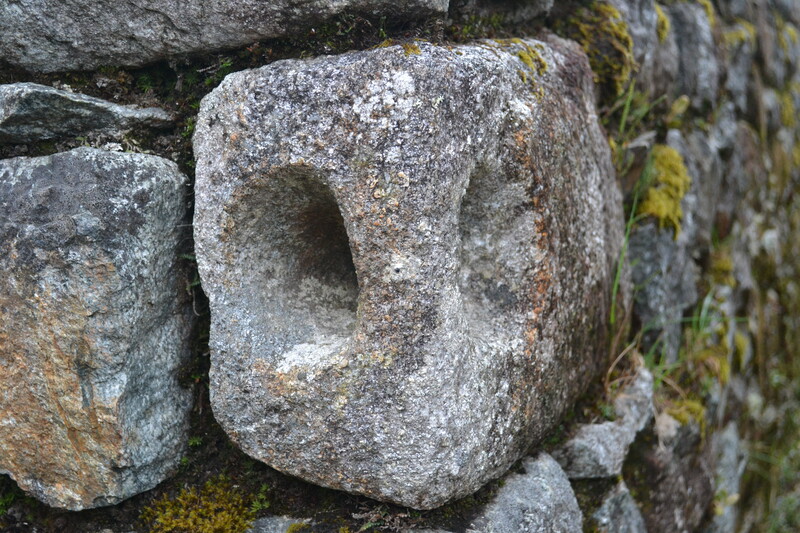 The smoothness of the precise Inca stonework is well-known. But to run your fingers across it and realize it was made by hand provides connection and meaning on a very human level. 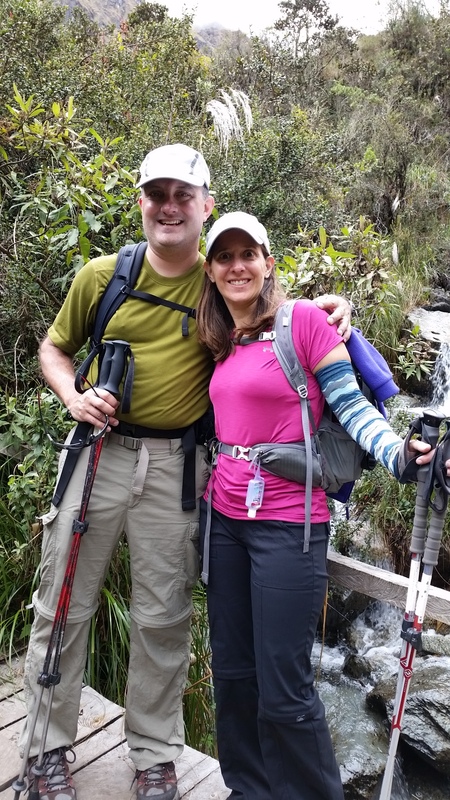 It is impossible to exaggerate the importance of using hiking poles on the trek. The grip of the poles in my hands not only helped take some of the work of the challenging 45K hike out of my legs, but it gave me confidence when going down the steep stone steps. So many times I commented how glad I was to have a firm grip on the poles. 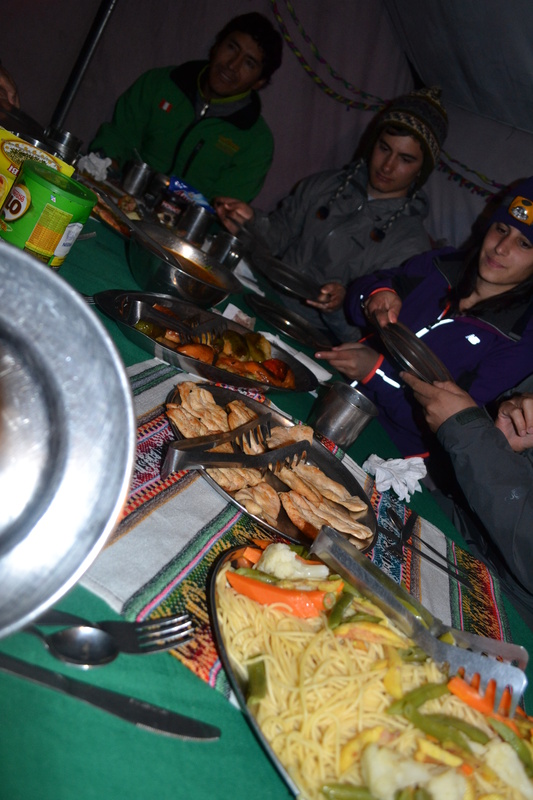 The bowl of warm water that our chaskis brought to our tent each morning and night was wonderfully refreshing. Washing my face with warm water was a simple pleasure for which I was grateful. We also had water to wash hands before meals. The weather is extremely varied along the trail. In the course of one day, I would wear a short sleeve shirt with either a long sleeve shirt over it or arm warmers. Sometimes I’d throw on my fleece jacket, too. My headwear alternated between my running hat and my running skullcap (with earflaps). Gloves went on and came off multiple times a day. Feeling the weather change as we hiked through several microclimates every day heightened my appreciation of the physical nature of our journey. Let’s face it. Camping isn’t really comfortable. John had never camped a night in his life before this trip. Muscle soreness from hiking + aches and pains from sleeping on the ground = A clear reminder that we’re not 20 anymore. But the views from the tent were priceless. 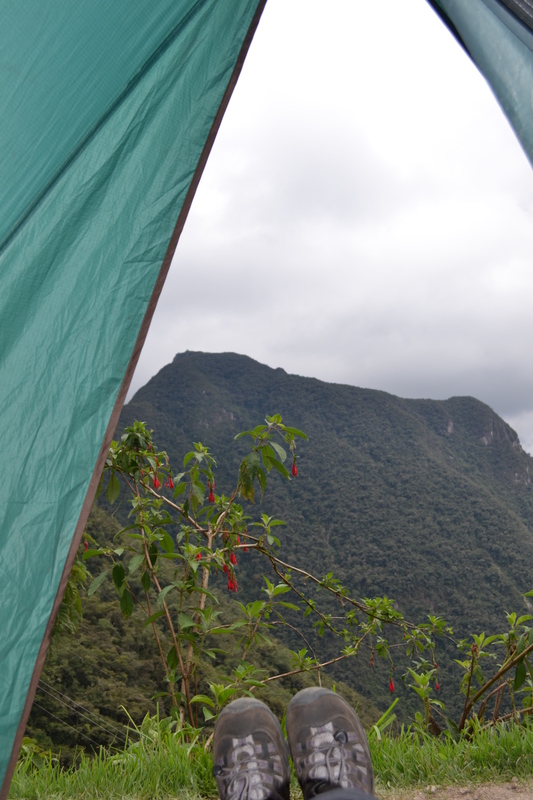 Out of the tent, looking right at Machu Picchu mountain. Do you like eggs and fresh fruit for breakfast? Or do you prefer pancakes? Hot chocolate, tea, or coffee? We had all of these things, each and every morning. If none of that appeals to you, stick around for lunch and dinner, where each meal included some kind of chicken, some kind of fish, two vegetarian dishes, yucca and potatoes, and other foods I can’t even remember. So.Much.Good.Food. All while camping. I never knew Peru had such awesome soups. 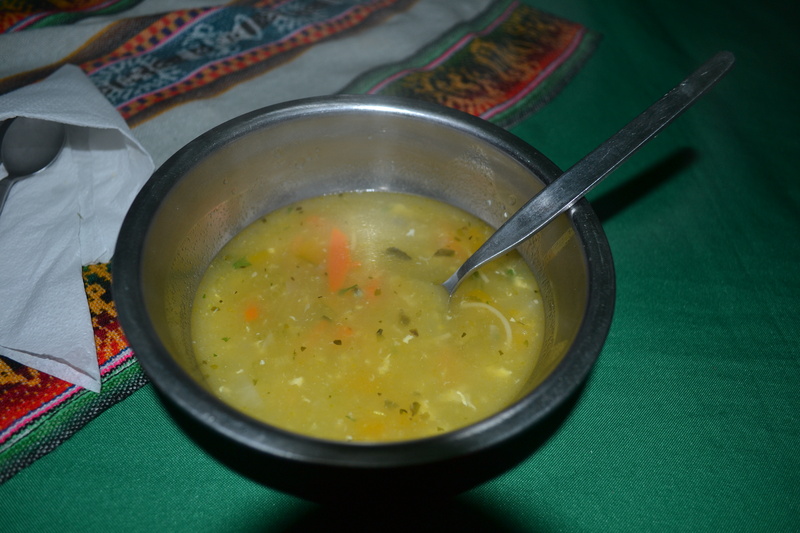 Each of our dinners began with a soup course, and each soup was better than the last. Maybe it was the warmth of the soup, or maybe it was the varied but always fresh flavors, but MAN that soup was good. We had a professional chef as part of our eight-person tour group, and he even commented that the soups were outstanding. 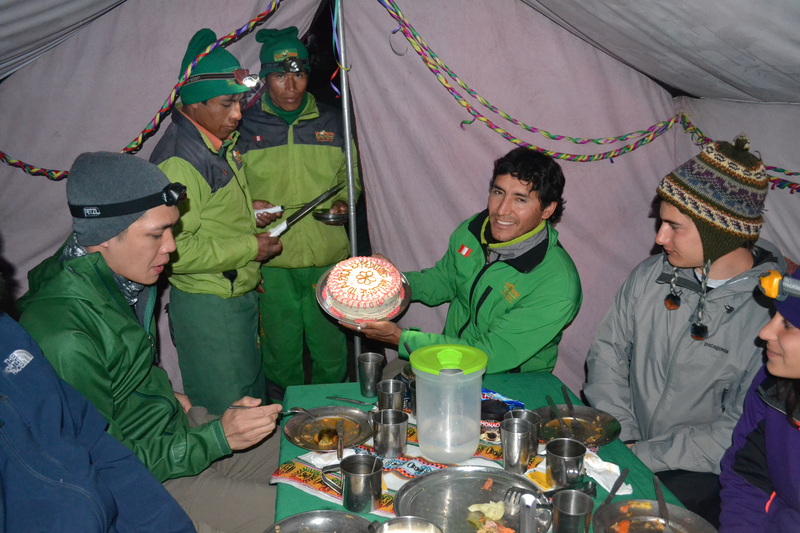 To celebrate our three days of hard hiking, the chef steam baked a cake for us on the last evening. We shared it with the chaskis, savoring the satisfaction of hard physical work and delicious cake—two of my favorite things! …it was really hard to a) follow a prescribed path around the site and b) share it with 3000 other people. 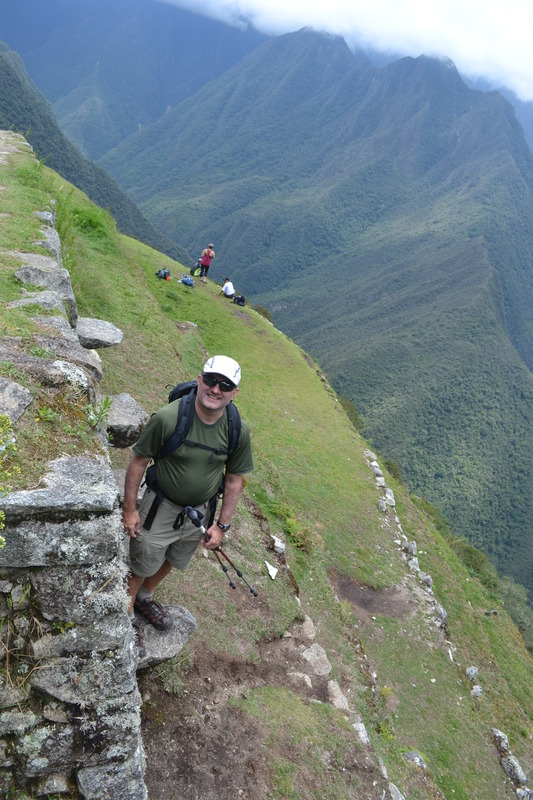 As such, if you have interest in going to Machu Picchu, I encourage you to hike the Inca Trail. 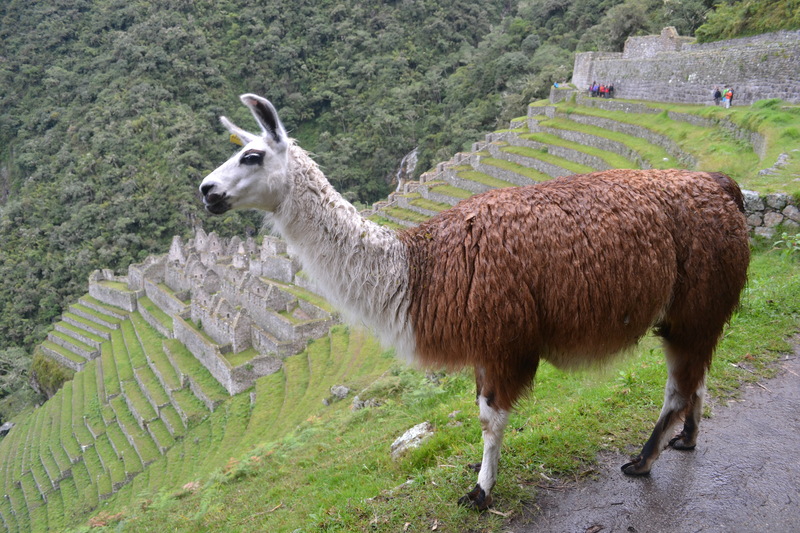 You’ll gain an incredible appreciation for the Inca people and culture as a whole, thus better contextualizing your understanding of Machu Picchu itself. 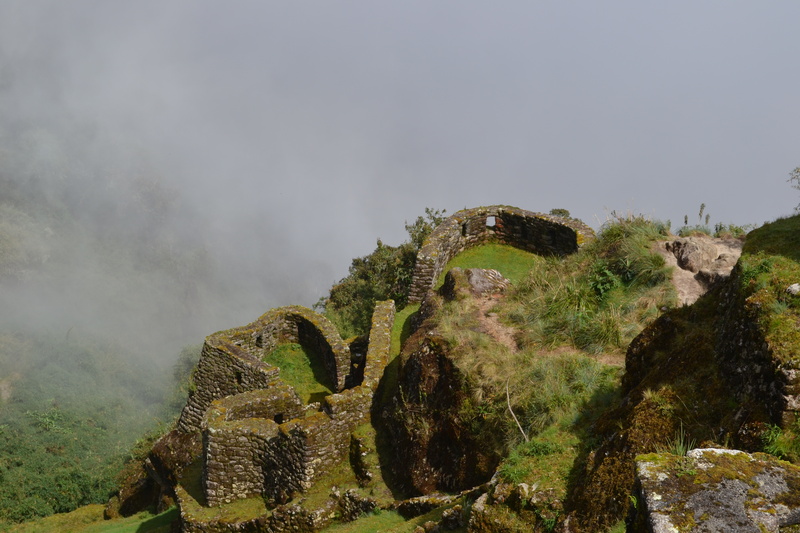 Even better, you’ll have had the experience of so many other Inca sites, exploring them as you wish, and completing the trek is terrifically satisfying. This entry was posted in Uncategorized and tagged blessings, fitness, goals, travel. Bookmark the permalink. The eight people in our group ranged widely in fitness levels. Everyone made it! One of the things I liked about Alpaca (as opposed to some other companies we saw on the trail) is that we could all hike at our own pace. Our guide gave us a stopping point every 30-45 minutes, and we’d just wait for everyone in the group to catch up.